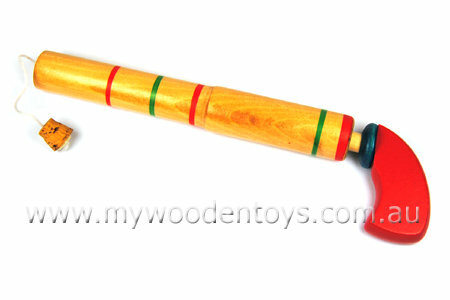 Wooden Pop Gun is a classic wooden toy which has been around for generations. This wooden Pop Gun works by pulling back the handle which pulls the string and forces the cork into the barrel. You then push the gun handle forward and air pressure "Pops" the cork out of the gun. The cork is attached to the string so it doesn't get lost or shoot across the room. A great little traditional wooden toy. Size: Length 22cm, extended 32cm. Material: Wood with Child Safe Paint, Nylon cord and cork. We like this because: "Makes a great "Pop" noise"